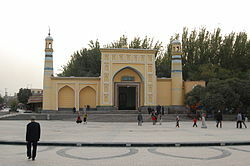 The population of Kashgar Prefecture is 4,499.158 according to the 2015 census. It has a population density of 35.5 inhabitants per km2. ^ "KĀSHÍ DÌQŪ (Prefecture, Xīnjiāng Wéiwú'ĕr Zìzhìqū) Population". City Population. This page was last edited on 8 April 2019, at 04:00 (UTC).